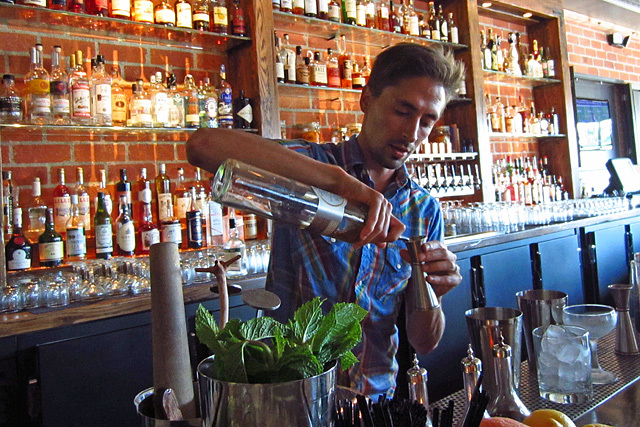 With the craft cocktail movement continuing to permeate Los Angeles, more and more quality bars and cocktail programs are emerging beyond the city centers to local neighborhood spots. 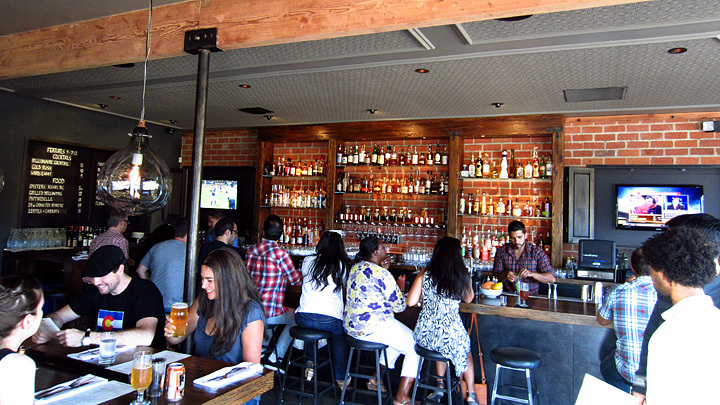 Case in point is The Corner Door, which opened June 1st in Culver City on a burgeoning stretch of Washington Blvd. that also includes A-Frame and Waterloo & City. Owners Todd Jerry and Anthony Falati went beyond the call of duty for their casual restaurant by bringing in chef Luke Reyes (previously of The Tasting Kitchen) and bartender Beau du Bois, who was a key member of the opening team at the acclaimed MB Post. I was way overdue to check out du Bois’ latest gig and was eager to meet up with mi hermano en cócteles Dave Stolte for a recent TGIF session at The Corner Door. The intimate space has just the sort of straightforward design you’d want from your local: brick back bar, pendant lamps, dark color palette. By the time I sat down at the bar, Stolte had worked his way through most of a Negroni, and the charcuterie plate he had ordered for us showed up shortly thereafter. The cocktail menu is divided between Classics and Originals. I started with an Original, the Louisiana Regular ($12): rye, Bénédictine, grapefruit cordial, Peychauds Bitters and absinthe. Du Bois’ take on the New Orleans classic Cocktail à la Louisiane uses the grapefruit cordial in place of sweet vermouth, lending a bit of tart acid to the savory and complex profile. 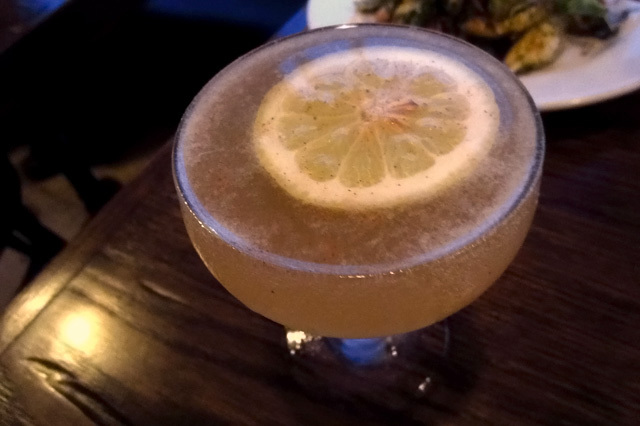 The Louisiana Regular was perfectly attuned to the waning summer and would be an ideal introduction for anyone unfamiliar with du Bois’ classically driven cocktails. 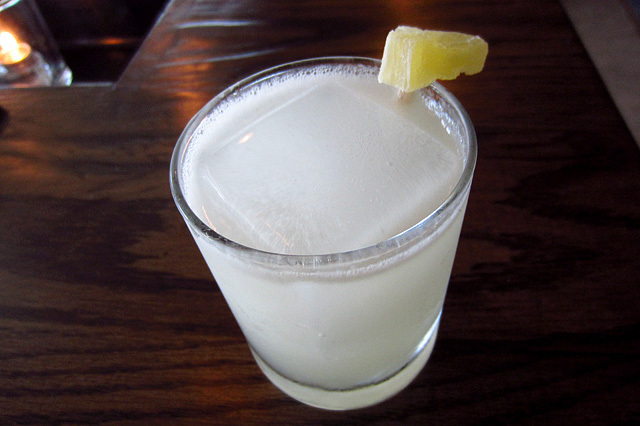 Stolte went with another Original, the Mezcallin ($12): Fidencio Mezcal, lemon, ginger and pineapple gomme. Du Bois’ well-balanced take on Sam Ross’ famed Penicillin makes good use of the pineapple gomme to highlight the smoky, peppery mezcal. Appetites properly whetted, we opted for a table by the expansive open windows, which not only gave us more room to order apps from Reye’s spot-on menu, but also some much-needed space for the drinks that du Bois graciously sent out to us. 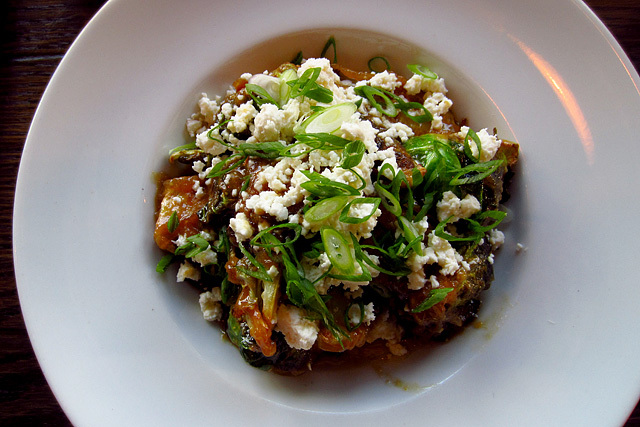 Brussels sprouts ($10): roasted and fried, topped with feta. 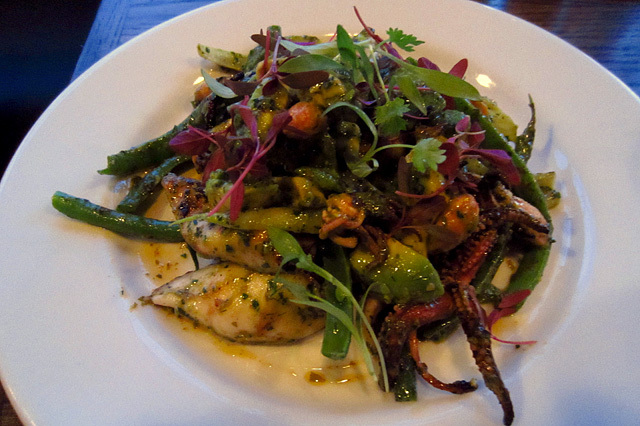 Grilled squid ($12): summer beans, avocado, chermoula, almonds. 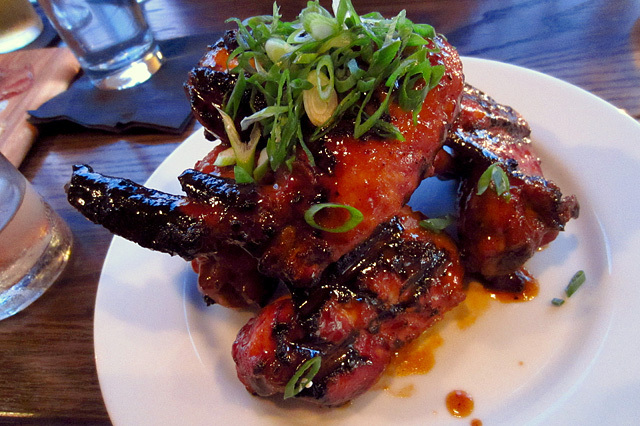 Cider glazed wings ($11): chipotle, brown sugar, scallion. Next was the Fortune & Glory: gin, orange juice, cantaloupe, absinthe and orgeat. Bloody Marys and Mimosas may rule the roost when it comes to brunch cocktails, but the Fortune & Glory would fit right into that rotation. 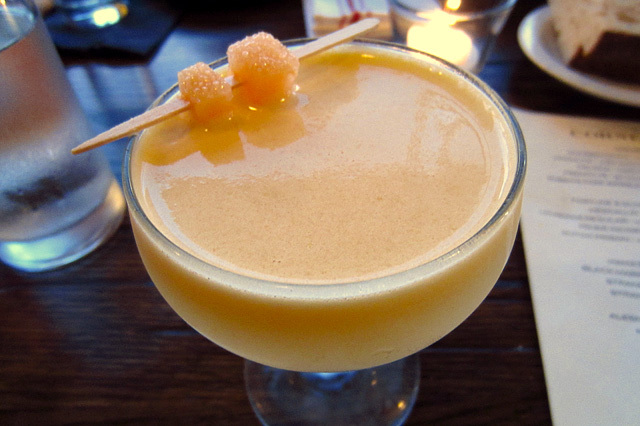 Of course, just because The Corner Door doesn’t serve brunch doesn’t mean you shouldn’t start off the evening with this smooth and velvety take on the classic Monkey Gland. 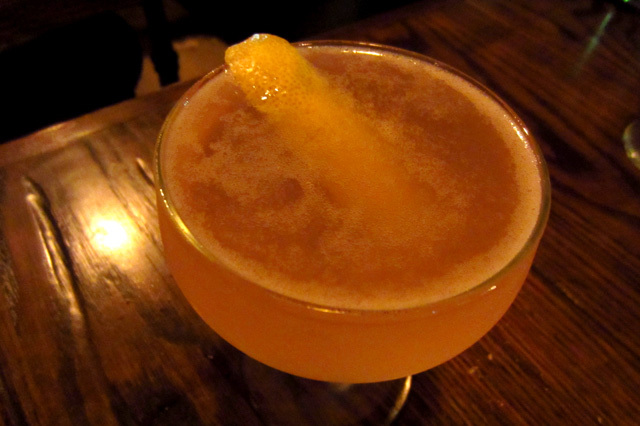 Another Original came next, the Dutch Prison: arrack, Pierre Ferrand Dry Curaçao, lemon cordial, peach, black tea, cinnamon. Du Bois deftly offsets the arrack with the ubiquitous Pierre Ferrand to give the Dutch Prison a dry, citrusy richness that’s anchored by the bitter black tea. This standout interpretation of the classic French 75 is made with gin, lemon, Lillet Rose, sugar, peach bitters, prosecco. Du Bois had earlier promised an “anti-Negroni,” and for our last drink he walked over an off-menu creation that he called the King’s Assassin: Citadelle French gin, Cocchi Americano, Dolin Blanc, Cointreau, Salers Gentiane Aperitif. 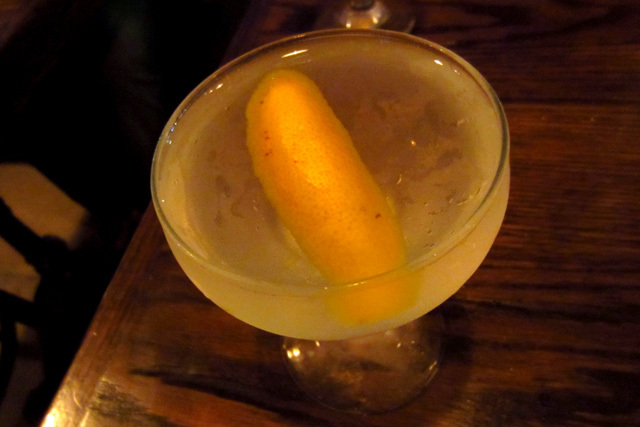 The distinctly bittersweet and vegetal Salers gives this killer cocktail its backbone, with additional depth provided by the Cocchi. Our enthusiasm for the King’s Assassin must have carried over to our neighbor, who requested one and enjoyed it as much as we did. 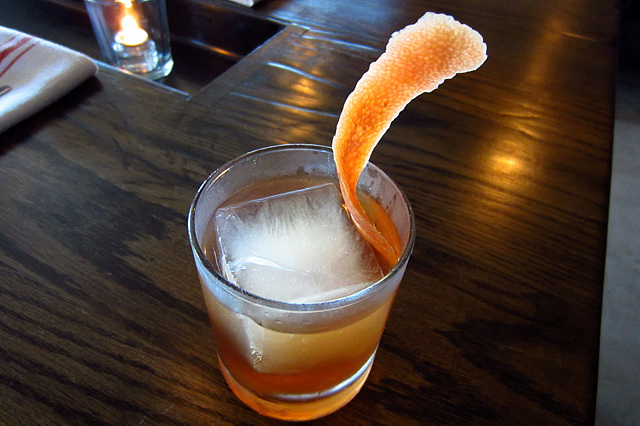 It’s a superb drink that will surely make it to the upcoming fall menu. Speaking of which, The Corner Door’s Twitter feed has been blowing up the last week or so with cocktail pics, and with the official start of the fall (at least according to the calendar), time may be running short on the current cocktail list. Of course, that also means it’s almost time to make a return trip for the new list and that Kings’ Assassin.